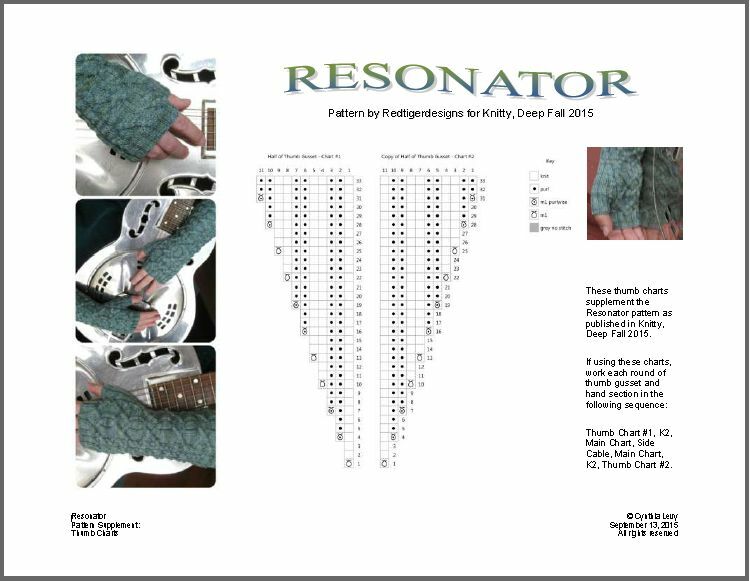 Resonator was published in Knitty Deep Fall 2015 and the pattern is available for free on the Knitty website. These mid-arm length fingerless gloves will warm even the most stubborn hands. They feature a maze of intertwining cables on a background of reverse stockinette. A semi-solid color yarn with great stitch definition shows the cables off to best advantage. The sample pair is worked in Indigodragonfly CaribouBaa. The name of this design was inspired by the resonator guitar appearing in the photos. This particular guitar is a family treasure passed down to my husband. Resonator guitars are showpieces of the acoustic world, thanks to their shiny facade and clear tones. These gloves capture the same crispness and flair in their intricate cables. Through the Knitty tech editing process, changes were made to the Resonator charts to facilitate grading and accommodate the publishing format. The draft design included thumb gusset charts which were replaced by written instructions in the final version of the pattern. But, since some knitters might find those charts useful, I'm making them available here as a supplement to the Knitty pattern. Just click on the download link below to access the file.